Disney Bans Selfie Sticks!? Yes, and Thank You! See, even our family takes selfies! This time at Los Nardos restaurant in Havana...but selfie sticks? No way! Selfie sticks are long and usually made of metal. In some countries they are the only weapon the policemen carry! Even if you never encounter a selfie stick wielding mad man who is better armed than the local police during your travels, you are very likely to get bonked in the head with one at Leaning Tower of Pisa. Selfies at a funeral or with the WWII Veterans Memorial? We've all seen the pictures, we've all feigned the outrage (because I know I've been so good at feigning outrage and then being guilty of being outrageous myself) This is a slippery slope, and I know culture changes, and the next generation does things their way. But it's disrespectful to any culture to not do your homework. Understand what happened at a place, or what a monument exists to commemorate and what it means to the people there. Lots of people head off to Vlad the Impalers castle in Romania like they are taking a ride through the Haunted Mansion. But he was a real guy, a real bad guy, who killed real people, in a real bad way, even if it was a real long time ago. It's still important to respect that fact and the people who live in that place and may still find it difficult to live with that history. Lastly, even if you are certain you would never commit the 3 Ds, (Mrs B-C would be proud) I'd still suggest this reason for not using a selfie stick. Maybe this story will give you the motivation and courage needed to hand your camera to a stranger when you are standing in front of a monument instead. My husband was taking pictures in Turkey on the Asian side when a young woman in a head scarf traveling all alone pantomimed askimg him if he would take her picture. She probably recongnized that since his camera was more expensive than hers, he would be unlikely to run off with it! He obliged and used her camera to take a photo. Jeff, who always appreciates an opportunity to get a street portrait, pantomimed back asking if he could take her photo with HIS camera, she agreed and posed, then she pantomimed that she would like to take a photo of him with HER camera. Not a word was exchanged, but later my husband told me this was one of the most interesting and special encounters he's ever had taking street portraits, and felt like he'd made a friend. So leave the selfie stick at home, save the art work and your fellow travelers from concussions and every time you hand your camera over to a stranger to "take our picture?" you have an encounter, a real connection with a real person, and you have the opportunity to make a friend. And isn't that why we travel? 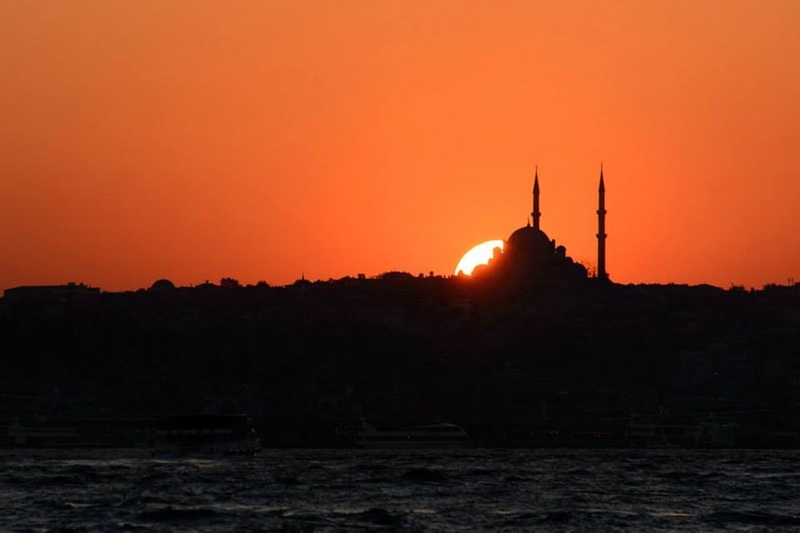 Jeff was shooting Istanbul at sunset when a stranger asked him to take her photo..